So just when you think the media has plumbed the depths it can always find a new low. 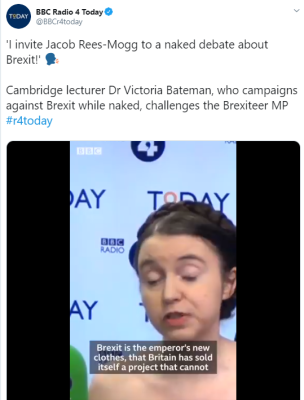 Today it's remain campaigner Victoria Bateman getting her norks out again. That to the BBC is newsworthy. It didn't help that this was the first thing I saw when I woke up. It pretty much set my mood for the day. At the moment I have two basic emotional states - catatonic with boredom or bloody furious. This puts me very much in the bloody furious state. After three and a half years of writing on Brexit, with well over a million words and three million hits on the clock I've not had a single invite from the BBC - yet if you put on a supergirl costume, or indeed take your costume off, you have their full attention. Also helps if you're a remainer. If you type "stop brexit protester" into google you will see the idiot with the loudhailer who interrupts television interviews covered by just about every major news outlet. This is a media which can only deal with trivia and novelty. It's days like this when I don't care if we leave without a deal or not. 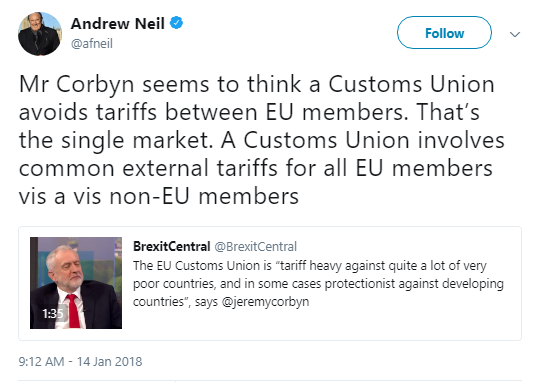 Even when the BBC is attempting to be a serious new enterprise it utterly fails, most recently with Portillo on the Andrew Neil programme asserting that the EU wants a border because they want to be able to collect the tariffs. The fatuous Tory oaf blithely opines having acquired zero knowledge the whole time. 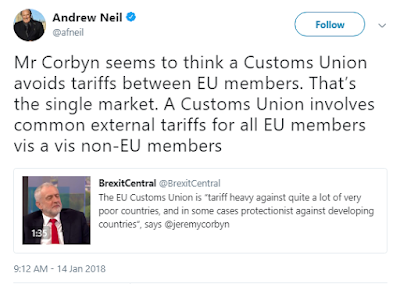 Nor indeed has Andrew Neil. It's bad enough that commercial enterprises exist only to fill airtime but across the board the BBC, supposedly fulfilling a public service remit, is failing to inform viewers and for the most part is misinforming them. Being part of a collapsing political bubble it no longer serves any useful function. In respect of that it wouldn't actually matter if I did get any worthwhile air time. 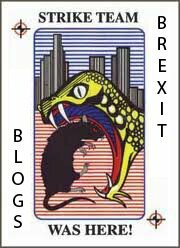 With both politics and media now in terminal decline, there is nothing that can now be said. This now has to coast along to its depressingly inevitable conclusion.